Sitting at a table with Rahman Abdul Raja, I enjoy one last ais kacang with a good friend. When I first committed to this trip to Asia, I had no idea this man would be my language tutor, informal guide & friend. I also didn’t know I would eat pig entrails, be given porridge at a mosque or see the world’s tallest twin building. 103 servings of white rice and 52 white coffeeslater and I finally handed in 6.8 gigabytes of images and prepared 16 minutes video content. What a blast it has been! The true testimony of this trip is measured in lives touched, not pixels. I’ve learned how Truth is working through each of our lives every day, whether you live in Asia or the Adirondacks. The Muslim holidays are over and now it’s the seventh lunar month, the Month of Hungry Ghosts. Buddhist belief tells that certain serious evil acts lead to a person’s spirit becoming a hungry ghost in a future life. 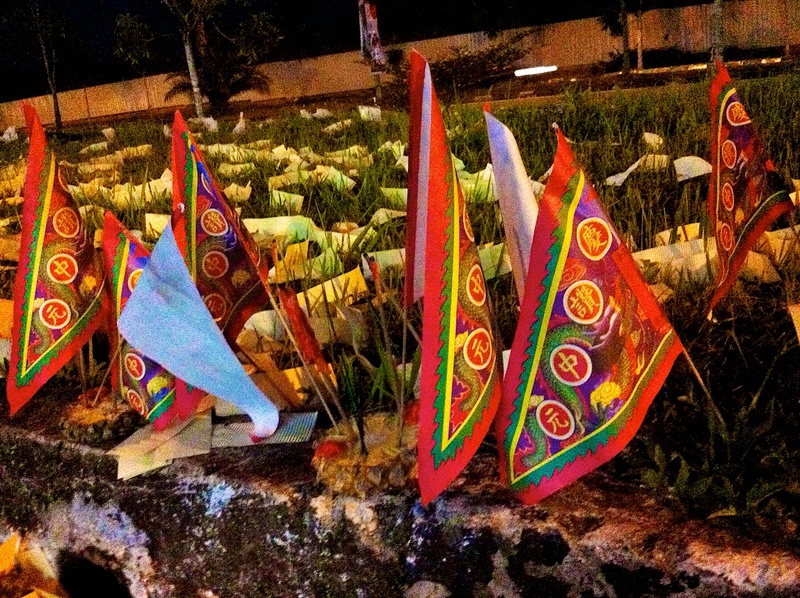 Out of fear of these spirits many burn paper money as offering and plant flags to keep evil away. In Singapore last week, I saw offerings being burned in 55-gallon barrels on a well-traveled city street.